Also known as Aroeira, Brazilian Pepper, Rose Pepper, Florida Holly, and Christmasberry. 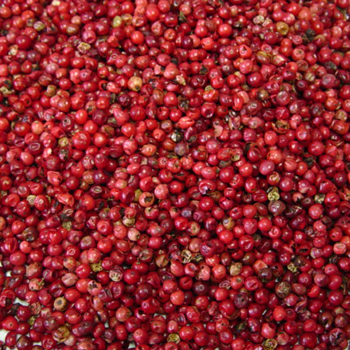 Pink peppercorns have a characteristic hot, fruity/tart flavor and are often used to impart a main flavor component to dishes. They not a true member of the pepper genus (Piper), and are more closely related to plants in the cashew family.